In today’s material world nothing is possible without money. Money is all that matters. And to earn money you need to have appropriate qualification and a suitable job for you. That dream job can be yours through a set path which starts with the writing and placing of a good CV in front of your prospective employer. Whether you are at the start, middle or end of your career you would always require a good CV to impress the employer or interviewer. Curriculum Vitae can be described as an all-inclusive tool that is designed specifically to showcase your life achievements in the fields of academics, extra-curricular activities, researches and professional accomplishments. This kind of document is almost like a resume but it differs from a resume in the point that CV is mostly used in applying for positions that are specific and requires field-specific knowledge and proficiency. To break down the two terms; Curriculum and Vitae, they are actually Latin words that mean ‘the course of my life’. CV can also be described as an outline of a person’s professional as well as educational history which is mainly prepared for job application. Placing your personal details can’t be better than jotting them all in a CV. A CV also acts as a marketing document for a person where your life achievements in academics and professional field are put in a paper or in a softcopy to inform and impress your prospective employer or the interviewer. In order to get a specific job related to your field, your skills, qualifications, abilities; it becomes necessary to showcase what you have. A CV solves this purpose in a very official way. What to Put in a CV? Normally the paragraph for personal details consists of the information related to name, address, birth date, phone number and email as well. In some cases, a well-suited photograph in this section can be of great help in presenting your body language and personality to your prospective employer. Next comes your educational details and your academic achievements. This would highlight your training and education that shows your knowledge in the field and impress your employer with it. Through a job, you come to gather many good and bad experiences in life. Whatever you have learned from your previous jobs and what you have experienced through it is of great importance and the prospective employer or interviewer comes to know it, from what you write in this section of Work experience. The interest and achievements section in your CV becomes shorter and crisp with the growing of your experience. This section includes some of your important life achievements that could make your CV a strong one. What other related qualifications do you have? Your employer would be interested if you have some good knowledge in other languages, Computing, driving and anything else that might benefit the company. Why do we need CV for Students? Think yourself as a brand new smartphone who has just been launched in the market crowded by other numerous popular and other not so popular smartphones. You are about to compete with them and have to make your buyer sure about the points why they would buy you over others in the market. The same is with you when you have just graduated and stepped out in the job market hunting for your suitable offer. You are required to showcase all your life accomplishments in very neat and tactical way so that you are able to impress your interviewer in the first go to that extent that they like to call you for a face to face round of conversation. One of the best ways of advertising about you to the employer is through a properly written CV. It creates an opportunity for the job seeker to showcase that he is qualified, skilled, well versed, motivated and all set to work for the company. A CV works to set you apart from all others in just one or two pages. How to Write a Student CV? You don’t know how and when your CV is going to be read by your prospective employer. He might be going through a number of whole lot of 50-60 CV s at a time in his leisure period. So, you should remember to make your CV so superb and so attractive that it makes it way out of the lot in the first go and your employer takes another opportunity to go through it once again and take the action to call you for a face to face interaction. So, you now understand how important it is to have a good and nicely written CV . Your career starts just after you have crossed your undergraduate level. Today in this article you would have a detailed idea about how to prepare clear and neat CV that could effectively impress the reader. Personal information like your name, contact number, mail id and contact address is necessary on your CV just to provide your employers about that details that is required to contact you. An interviewer may require your contact details to contact you in order to schedule an interview or a next round of meet up with you. So, short and crisp contact information would be simple and sufficient to solve the purpose. A list of the degrees that you have earned during the course of your academic journey is important enough to be listed at the very top of your CV. The degrees along with their date anticipated and the grade-point average should be listed clearly. If any result is awaited then you may list it as results awaited which would help the person to understand that you have appeared in the exam and you are likely to pass. You should also remember to add the most recent degree at the very top of the list so that it may grab the attention at the first glance. Listing any awards or honors that you have received during the course of your study adds a great spark to your CV. This is a very interesting section that your prospective interviewer would love to know. You may also include contests won, merit-based scholarships and grants, academic honors in this section. If you have any volunteer work in your possession they also need to be enlisted in this section as from this, your employer would understand your zeal towards contribution to the community outside your workplace. 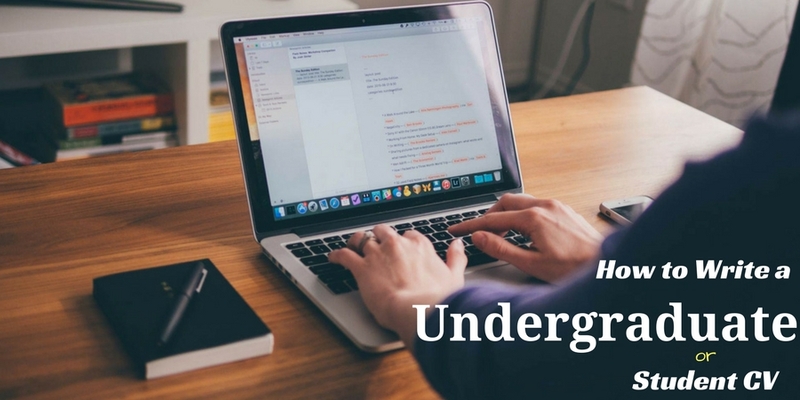 While being Undergraduate you may also have experienced any kind of job or any job situation experience through internships and training programs, your employer would be equally interested to know that. Every employer loves to see some sort of experience previously set in their employees. Though the experience must be related to your career area you may include summer internships or any on-campus research programs. In this section, you may also include those jobs that demonstrate your maturity in handling work situations, organization power, and communication skills. Any kind of professional training or certification done is also very suitable to be included in this section. Throughout your course of study, any kind of publication work adds weight to your CV. This presents your good communication skills and editing skills as well. It is also one important trait in employers that they look for multi-talented people over others. So, if you have any publications or research work , mention what would add importance to your CV in a great way. References addition plays an incredible role in a CV. To make your CV stronger you must add two – three good references like teachers and trainers in case of undergraduates or students. This means that these people whom you have added in reference section are taking the responsibility of all that you have jotted here in your CV. When you are including a reference you must be sure about what you are writing in your CV and you should also take prior permission from them to add their names and contact details in your CV. You should be very cautious before you pick somebody as your reference and sure that they know well about you. A strong reference is sure to mark your name in the interviewer’s eyes and you could get a better mileage in terms of being shortlisted for a face to face round. Where does CVs go wrong? Abreast of concentrating on how to write effective and impressive CV for Undergraduate or student level, you should also keep a note on things that you should avoid that could mark the purpose of your CV. You should have knowledge about those areas which your employer would not prefer to see in a CV. Avoiding to mention such things in your CV would be helpful for you to create a positive impression in the employer’s eyes and increase your chances to get selected in the next round. Lack of relevant information: Many of us sometimes make wrong assumptions about what is important for the employer and tend to provide wrong and irrelevant information in our CV. This is very annoying for the employer to go through a CV full of unwanted information and this creates a negative impression on you. A tricky avoidance of such information should be attempted. Something that you are not and mentioning that in your CV creates a degrading impression as a whole. Not only saying that you have great communication skills but an exhibition of that in your CV is also must to amaze the reader. Your CV should be impeccably presented in order to be at least read once. Many CVs get rejected just due to endless errors in them. So, write crisp and error free CV that would exhibit professionalism at work. Many of the prospective job seekers write too many things in their CV trying to keep several options open for them. But unless and until your employer is not clear about what you do exactly then how they would understand what they could do with you? The use of unnecessary jargons, clumsy languages and expressions and clichés can sabotage the chances of getting a job for most eligible candidates. CVs should not contain “I” rather you may use positive action words which are more powerful. It is a thumb rule of CV writing that it should always contain positive things only and no negative comments at all. You should never criticize about your previous employer in your CV. You should also note not to refer to disappointments and difficulties in your CV. Do brief researches to find out what actually the employer is looking for in his employee. Prove your eligibility and ability by short examples wherever possible. Aim to include all that you want to in just 2 pages as more than that would be super clumsy. You should proof read your CV thoroughly for errors. A cover letter is a very good tool to impress your employer in few sentences. So, never fail to include one with your CV. Do not add negative points or criticism. Use of fancy layout and decorative fonts may make your CV more clumsy and create negative sense on your employer. If you find at any point that your CV is not being shortlisted by any employer for a considerable period of time, then you might contact a CV consultant and talk about if your CV is doing right justice to you or not.